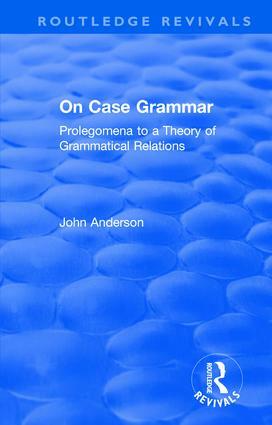 Originally published in 1977, On Case Grammar, represents a synthesis of various lines of research, with special regard to the treatment of grammatical relations. Arguments are assessed for and against case grammar, localism, lexical decomposition and relational grammar. The book surveys the important evidence to support the validity of the choice of a case grammar as the most satisfactory of current accounts of the notion of grammatical relations. This evidence is derived from a detailed examination of various processes in English and from a typological comparison of other languages, notably Dyirbal and Basque. The book also looks at the establishment of principled limitation on the set of case relations. Lexical, syntactical, semantic and morphological evidence suggests that the set of cases is in conformity with the predictions of a strong form of the localist hypothesis, which requires that case relations be distinguished in terms of source vs. goal vs. location.